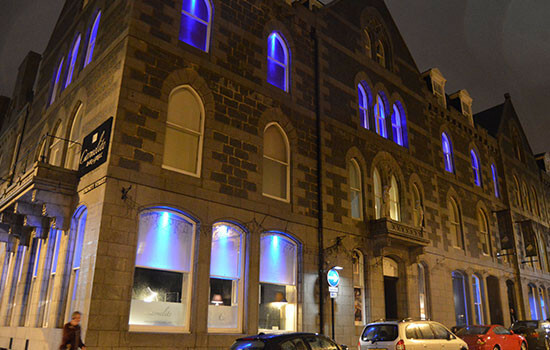 Beautiful boutique rooms in the heart of Aberdeen city centre. Morning tea stacker or afternoon tea? Carmelite is the perfect venue for every occasion. This chic venue located in the city’s Merchant Quarter, encompasses designed boutique rooms, eclectic suites and economy accommodation. Relax in either booth, lounge or formal dining seating for coffees, theatrical cocktails, whilst choosing from menus of local foods including char-grilled steaks, informal bar munchies, and a fabulous selection of champagnes and wines. Carmelite is often referred to as the Hidden Gem’ as only a 3-minute walk from Aberdeen transport hub (train & coach station, direct airport link & harbour), surrounded with the city’s retail centres and minutes from cultural and entertainment venues such as Tivoli Theatre, Maritime Museum, His Majesty’s Theatre, Civic quarter and many others. All rooms have Freeview TVs, free WiFi, work desks, tea/coffee making facilities, iron & board, quality bed linen, private bathroom with/or shower room with designer bath/shower products and hairdryers. Personal alarm clocks are available in all rooms too. Let us help you plan a day to remember. Planning a meeting or corporate event? "Just to say a huge thank you for all your efforts at the weekend – the chorus were well impressed with the facilities, the food and the accommodation. Hopefully we will be rebooking for next year once we have a coach in place. I’ll be in touch." "I just wanted to send you feedback from our Christmas party last Thursday. Everyone had a brilliant time and the entertainment and music was excellent. Well done it putting together such an enjoyable evening." "Hello Katie, just wanted to say a huge thank you from myself, the bride and the girls on the hen do for the Mad Hatter dinner we had the first weekend in August. I'm sorry it's taken so long for me to get round to saying thanks! It's been a busy time! Your service in the lead up to the weekend was really excellent - couldn't have been better. We just missed you when we arrived so I didn't get the chance to thank you in person. The Mad Hatter also does an outstanding job. She really was fabulous. Also, the room itself, the decor, the decorations and the attention to detail was really outstanding and the food was delicious. I'm not a Trip Advisor user but I really would highly recommend Carmelite to anyone who asks or to anyone heading to Aberdeen." "I just wanted to drop you a note to say thank you. We had a lovely time, the food was lovely, the room was perfect and my dad was suitably surprised." "I just wanted to let you know how the event went after you left. It was amazing; the food was amazing, the atmosphere was amazing, I loved every single second. I need to thank you so much for all the help. I have had so many good reviews from people and I will definitely be looking at having it at the Carmelite next year!"